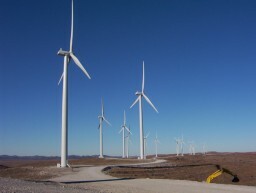 Over the last 30 years, the wind industry has grown significantly, and wind power has become a recognized renewable alternative to conventional carbon-based power because it is naturally produced, environmentally clean, and relatively inexpensive to use over the 20-year service life of a typical wind farm. Expenses for wind power projects are higher during the construction phase, but are reasonably manageable as costs of land, wind turbine generators (WTGs), transmission lines, and other project essentials are fairly fixed. That being said, there is a cost that can be unpredictable – building tower foundations. Selecting the best foundation strategy for a project can result in significant cost savings as compared to always using a conventional spread mat foundation. Choose a consultant that can help you make these cost-effective choices. There are also new cost-saving approaches that are expected by the wind industry today. An example of this is utilizing the geotechnical engineer-of-record to design the WTG foundation, which streamlines the design process, minimizes risk, and provides better value-engineering. To meet this industry trend and better serve our clients, Terracon is teaming with Patrick & Henderson (P&H) to offer proprietary foundation design services. This partnership allows for a cost-effective, seamless, and efficient delivery of wind turbine projects. P&H engineers are value-added team members that provide foundation engineer-of-record services, as well as balance-of-plant (BOP) civil engineering services for wind energy projects. BOP civil engineering covers most project elements that surround wind turbines including access roads, substations, and operations buildings. The P&H collaboration also completes our “turn-key” process for these projects that includes environmental due diligence, geotechnical and foundation design services, permitting, and materials testing services. One technology that Terracon and P&H utilize is the Tensionless Pier (TP), which is different from a conventional spread mat foundation that is typically used for WTG support. This is because the TP transfers the foundation loads to the surrounding soils that support it. The TP resists these loads by utilizing the frictional resistance of the soils around the pier, with less reliance on end-bearing of the pier. Compared to the TP, a spread mat foundation resists vertical and movement loads applied to the top of the foundation through the weight of the foundation and the bearing capacity and soil-concrete friction along the base of the foundation. 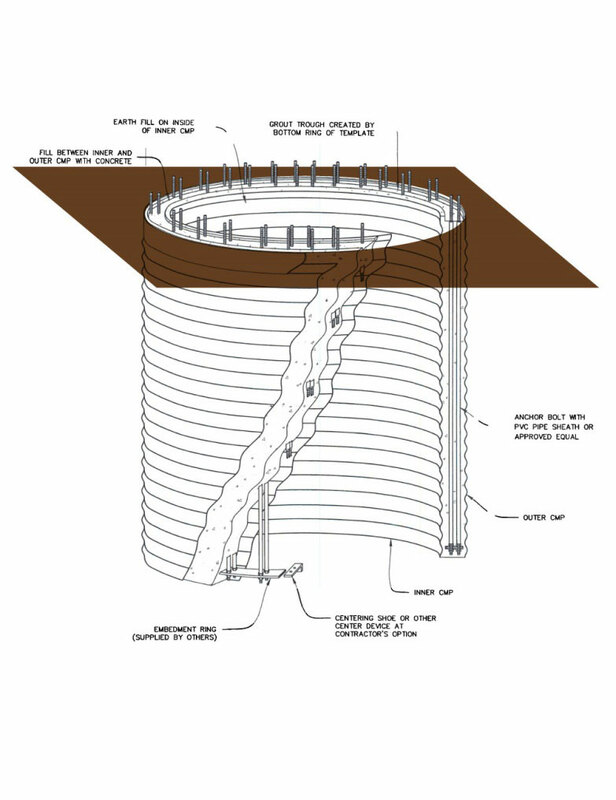 The TP system consists of two corrugated metal piles (CMP); one outer, typically 14 to 16 feet in diameter, and one inner, usually 10 to 12 feet in diameter. 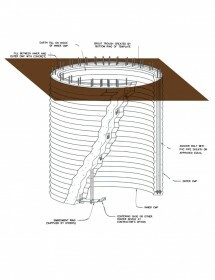 The TP is typically 26 to 34 feet deep depending on WTG loads and site geo-materials. The inner CMP is filled with compacted excavation spoils, and the annular space between the excavation and outer CMP is filled with lean concrete. PVC-encased threaded steel anchor bolts are aligned to match the WTG base flange holes and are installed between the CMPs, with a steel embedment ring at the bottom. Post-tensioning of the bolts, after the bottom tower section is installed place the foundation into compression, creating a tensionless foundation system. The TP is a more environmentally-friendly foundation system, as it uses 20 to 35-percent less materials (i.e., rebar and concrete) than a conventional mat foundation. The TP also has less of an excavation footprint that includes an 18 to 20-foot diameter hole, compared to a 65-foot diameter mat system. In addition, the TP is greener as it reuses at least half of the excavated soils, which are used as ballast in the center of the foundation. The TP is a “win-win” system, as it saves the owner money through less time and materials, while also protecting the environment. In the event that hard bedrock, soft clay soils, or loose sands with high groundwater levels are encountered making TP construction difficult, P&H has anchor foundation solutions that include rock-anchor foundations and pile-anchor foundations that utilize micro-piles, helical anchors, and/or auger cast piles. Wind power and other renewable resources are a part of our future energy independence, and utilizing cutting edge technology like the Tensionless Pier will help make wind power projects more efficient and cost effective.